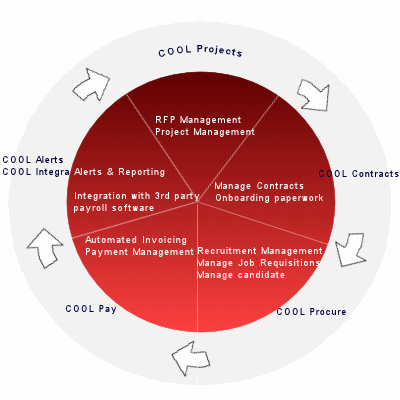 CoolWorks is an integrated procurement platform with powerful projects proposal, contracts, recruitment, engagement, timesheet, invoicing and payment management features. The CoolWorks - Integrated Procurement Management System (PMS) - is a web based suite of applications that can manage projects, RFPs, contracts, procurement, payment and integration with other systems at a reasonable cost providing measurable ROI. The ultimate goal on a PMS solution is to procure the best resources at the best rate. A successful PMS program is one where clients work with vendors to obtain quality resources at competitive market rates, in a timely and efficient basis. CoolWorks provided that ability and the ability to conquer your world. RFP Management with Cost and Technical evaluation of proposals. Manage contracts & get alerted on contract expiration and many more important alerts. Automated timesheet integrated with payroll software. Recruitment management integrated with job boards. Powerful E-mail blast feature to vendors, candidates with opt-out feature.